Is Android app code support just the beginning? Why stop with Android app code support? It goes without saying that Microsoft has revolutionized the world of computing, even though its former business partner, Apple, is the more talked about player these days. Thanks to documentaries and movies, like Pirates of Silicon Valley, it's common knowledge that both Bill Gates and Steve Jobs were similarly inspired by what Xerox was working on at PARC, the photocopying company's research and development lab. For years leading up to the innovation of the GUI or graphical user interface, all interaction was done through a command prompt. Primitive by today's standards, it helped shape and mold a future generation of programmers and engineers who are now leading the development of some of the world's biggest projects. The GUI opened up a new window to the world, making the PC as common of a fixture in every home as the television. With hardware getting smaller, more powerful, and cheaper, it'd only be a matter of time before the next wave of innovation hit. In 2007, hit it did with the iPhone, the first touchscreen smartphone of its kind. Simple and intuitive, the OS was changed yet again. However, in the last decade since, mobile has become one of the fastest-growing sectors in human history, and giants have staked their claim at the top of the beanstalk. Microsoft, in the mobile world, hasn't been one of those giants. It's had a difficult time even getting a firm grip. Its biggest problem was that, like BlackBerry, the company seemingly took a back seat while the competition built bigger and better software. In 2010, Microsoft finally shuttered Windows Mobile, which didn't have the same good looks or expansive app-filled ecosystem as iOS and Android. Windows Phone, more than just a rebranding, would make better use of the touchscreen with a new tiled interface. Tiles are a collection of apps from email to your calendar, and they update in real time. Nokia phones would exclusively feature the OS, and as we'd later learn with Microsoft's acquisition of Nokia's devices and services business in April 2014, the company would shift its focus to developing more affordable smartphones than competing with the major flagships that dominate the market. Windows 8 introduced the tiled "Metro" UI to the desktop in 2012, but there was just one big problem: as demonstrated by Windows Phone, it's best on a touchscreen. Still to this day, Windows 8 is on just 14% of desktop computers, according to the most recent data from NetMarketShare. However, with Windows 10 just right around the corner, that's probably a good thing. Microsoft has learned from its Windows 8 mistakes, so much so in fact it felt the need to skip a number. While Windows 9 isn't coming back, the start menu is now front and center again, and the "Metro" tiles are now incorporated inside this menu. These are the same tiles which are featured on your Windows Phone device. However, the changes go beyond design, and stretch into mobile. For the first time ever, apps from the Windows Store will work across multiple devices. "Mobile experiences have largely meant app and web experiences built for mobile devices – most often defined by the phone you carry with you," said Kevin Gallo, Director of Windows Developer Platform. "But this is increasingly too narrow a definition for a growing number of customers who want their experiences to be mobile across ALL their devices and to use whatever device is most convenient or productive for the task at hand." For developers, it's a big undertaking. For the average user, it's a welcome simplicity. Of course, the app has to perform well everywhere, and we'll have to see just how well that pans out. There's also the issue of scaling properly across multiple screen sizes, which Microsoft claims to have worked out with its Adaptive UX. Apple has shown that better streamlining and integrating the mobile experience with the desktop experience has a tremendous impact in keeping users loyal to its products. Then again, iOS currently commands around 42% of smartphones and tablets. Windows Phone, on the other hand, has just a fraction of that at just under 3%, so it begs the question, how is Microsoft going to pull off this new vision? At Build 2015, the company announced support of developer-retooled Android and iOS apps on Windows 10 phones in order to scale the Windows 10 Store. That's a good first step. However, eventually, its OS may work on native Android devices too. 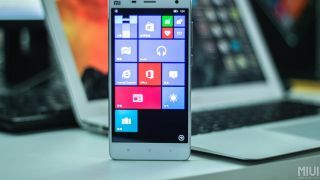 In March, Microsoft revealed it had developed a way to get Windows 10 working on Android devices. Partnering with Chinese giant Xiaomi, select users of the company's latest flagship smartphone, the Mi 4, could install the latest OS, "and provide feedback to Xiaomi and Microsoft on their experience." Over a month later, it appears Microsoft isn't stopping there. According to information and images obtained exclusively by Neowin, Chinese manufacturer Elephone is expected to launch a new high-end smartphone in June that dual boots Android and Windows 10. This opens up an interesting new opportunity for Microsoft, one that is no longer limited to its select line of Nokia devices. Over the years, CyanogenMod has shown great promise for custom ROMs. According to the company, it has over 55 million registered users, and to date, has received $110 million (about £77m, AU$140m) in funding. In the most recent funding round, who just so happened to be among the investors? Microsoft. Clearly, the Washington-based tech giant believes there's something here. Since the beginning, Microsoft has worked on making its software available to any manufacturer who wanted it. Google has done much of the same with Android, albeit going the open source route. Now, Microsoft wants to shake up mobile in the same way it shook up the personal computer. It believes Windows 10 is the culmination of years of trial and error, and it all focuses back on a familiar experience on every device you own. This includes the syncing of all content from from photos to apps, something Apple and Google have done very well. What if everyone could do this on the next Android device they buy? However, it'd be foolhardy to think that major Android device manufacturers would get onboard with a dual boot option. That's one more area they'd have to help support. Instead, this will likely be something users have to do on their own, and to make it easy, a simple guided installation will be absolutely necessary. There are still some unanswered questions, like whether Windows 10 will install alongside Android, or install over Android entirely? If it's the latter, I have a hard time seeing people willing to go all in. Microsoft still has a lot of convincing to do, but if it was to release its own dual booting phone, that might expedite the process. But it has loaded its software into the devices of eventual chief rivals to get its start. There's no reason that it can't to the same to make its comeback in phones.